The Grand Teton National Park Foundation has announced that the Grand Teton Lodge Company (GTLC) and Flagg Ranch Company, owned by Vail Resorts, have gifted a total of $130,000 in 2014 to support Inspiring Journeys, the multiyear restoration at Jenny Lake. This money was generated by an innovative lodging contribution program as well as a dollar-for-dollar match the organization created to incent their clients to contribute to this valuable improvement project that is restoring trails and resources around Jenny Lake. GTLC and Flagg Ranch Company have supported the Foundation’s work in the park since 1999, making the lodging group the largest and one of the longest running corporate partners in Foundation history. Gifts from GTLC and Flagg Ranch Company properties (including Jenny Lake Lodge, Jackson Lake Lodge, Colter Bay and Headwaters at Flagg Ranch) originate through their Lodging Program, a voluntary program that allows guests to contribute $1 per night of their stay to the Foundation’s work in the park. Projects supported by GTLC have spanned a wide range of enhancements and educational initiatives that connect visitors to Grand Teton and improve resources. The lodging program originated in 1999 with Clay James, former president and general manager of GTLC, which was owned by CSX Corporation. Vail Resorts continued the program when it purchased the company in the latter part of 1999. James launched the initiative at Jenny Lake Lodge and Jackson Lake Lodge with the goal of educating visitors about the benefits of private support in parks while generating significant funding for on-the-ground projects in Grand Teton National Park. By providing multiple opportunities for their employees to improve the park, GTLC continues to demonstrate its commitment to enhancing Grand Teton through volunteerism, a cornerstone of the company’s mission. In 2014, GTLC employees announced a goal of contributing 1,000 volunteer hours to Grand Teton over the next two years. Local employees chose to fulfill this challenge by completing trail work at various locations throughout the park, including brushing and clearing trails at Emma-Matilda Lakes, Phelps Lake, Death Canyon and Jenny Lake. Along with the work that was accomplished throughout the summer, GTLC employees participated in Vail Resorts’ annual Epic Promise Day in September. Vail Resorts’ Epic Promise Day is in its fifth season and is a one-day, employee volunteer event that features a service project in each of the resort’s communities. A total of 1,650 employees company-wide participated, volunteering a total of 6,600 hours in their communities. 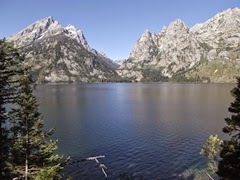 To learn more about Grand Teton National Park Foundation, please visit www.gtnpf.org. For more information on the hiking in the Grand Tetons, please visit our new hiking trail website.